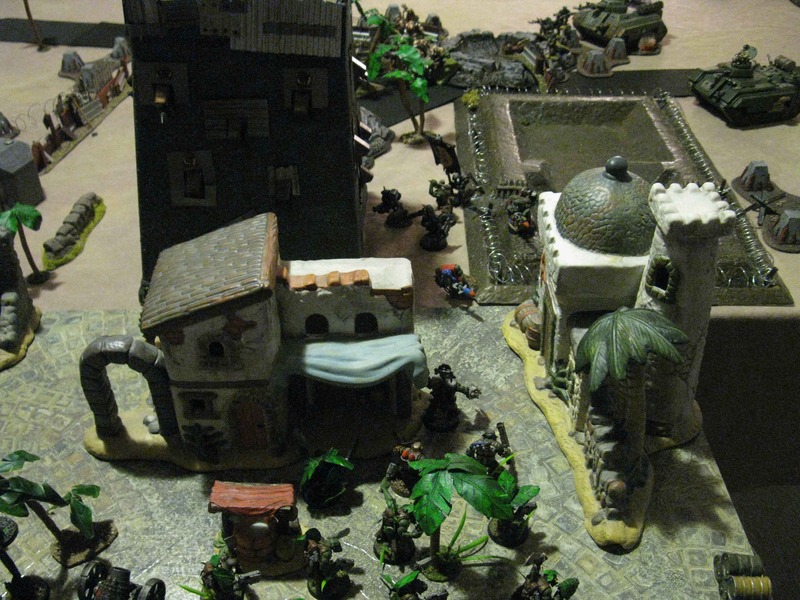 Shortly after the Outbreak of World Waaagh II, Greenskin forces went on the offensive in the Western Desert, pushing back the Imperium, and capturing the strategic port of Tobrork. A few months later, however, the Imperial Guard—reinforced with additional armour—counterattacked under the command of famed Field Marshal Tommy von Tommel and his famed “eBayka Korps.” Orkish forces (many of them ANZORKs from the southern colonies) were surrounded and besieged in Tobrork, their backs against the sea. There followed a race against time. Could the Orkish forces hold out until a Greenskin offensive could relieve them? Or would the Imperial Guard be able to overwhelm the defenders? 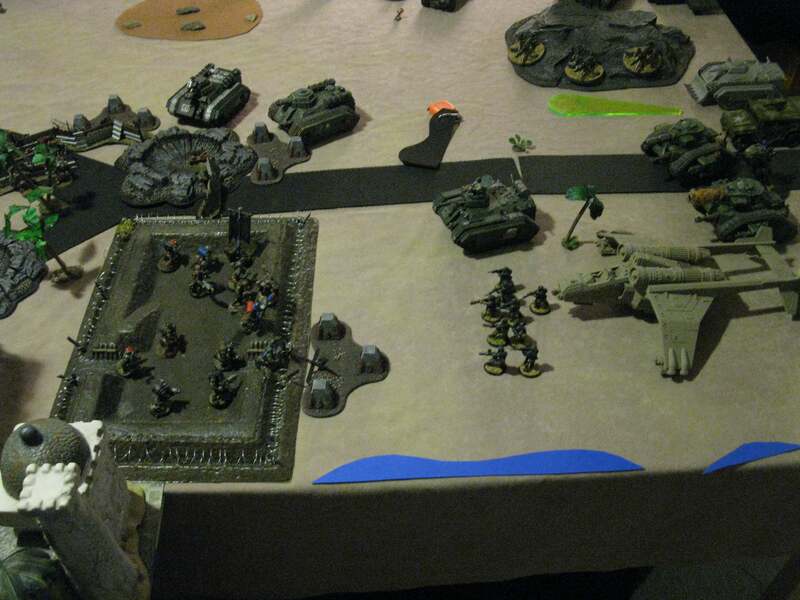 Forces: 2,000 points, Imperial Guard versus Orks. Rules: Modified Planetstrike. 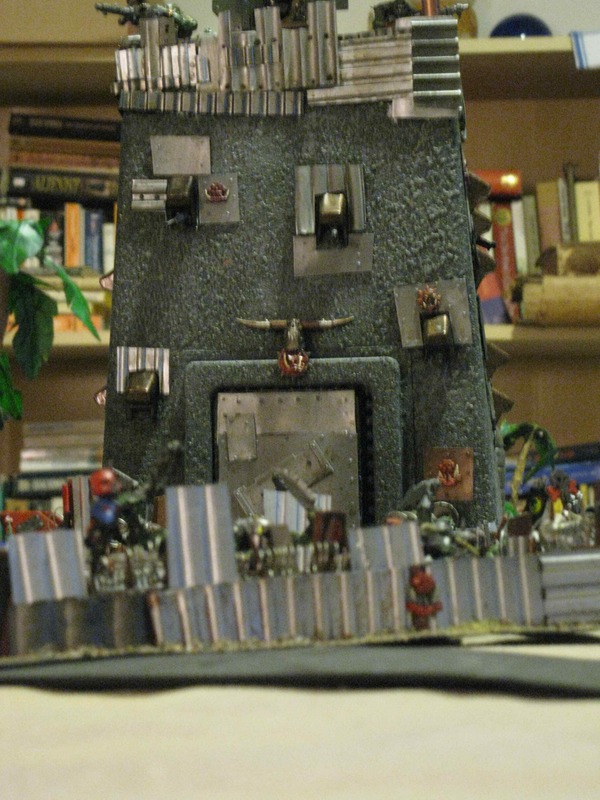 Orks hold four objectives: two AV 14 bunkers (worth 1 point each) and an AV14 bastion (worth 2 points). Objectives are contested and controlled as per the regular (not Planetstrike) rules. The bastion mounts a Orkarus Lascannon, and four Big Shootas. The attackers receive an initial 2D6+3 Firestorm attacks. Players need not reveal the contents of vehicles, buildings, or bunkers until they fire. Units in buildings (but not bunkers) that fire may be shot at, but receive a 3+ cover save. Attacker Deployment: No units may deepstrike. 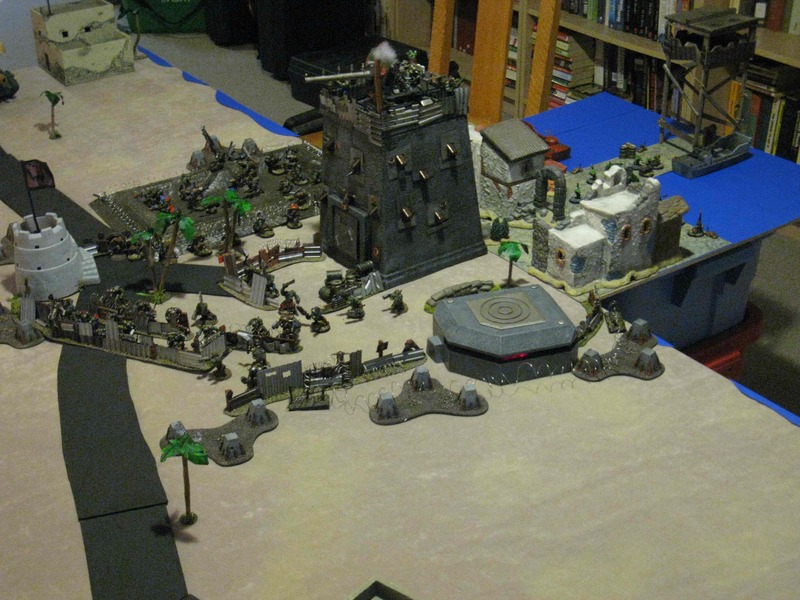 Two-thirds of Guard units may start anywhere on the table, provided that they are at least 20″ from the perimeter of Tobrork and 12″ from the eastern table edge. The remaining Imperial Guard are in reserve, and may arrive starting Turn 1 (3+) on the western table edge within 12″ of the road. No troops may flank or infiltrate, with the exception that Imperial flyers and skimmers may flank the same as Deffkoptas. The Valkyrie could be used to reinforce the assault, insert a squad into Tobrork, on its flanks, or even to block reinforcements from the south. With a ear-shattering roar, 8 massive Firestorm blasts rocked Tobrork, almost all of them aimed at the central citadel. 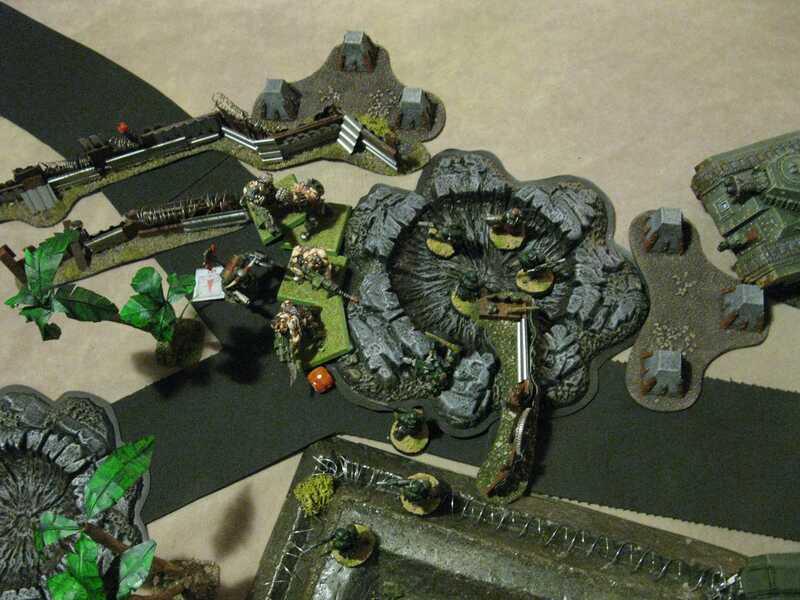 When the smoke cleared, however, only the Orkyrus Lascannon and a Big Shoota had been dinged, a few Boyz in the forward defences were out of action, and there was a large crater where there had once been a rather fine fungus garden outside the front gates of the bastion. Big Mek May Becheezybutdatsdarul patted the huge contraption on her back with satisfaction. A Kustom Force Field was indeed a useful thing to have in a siege. 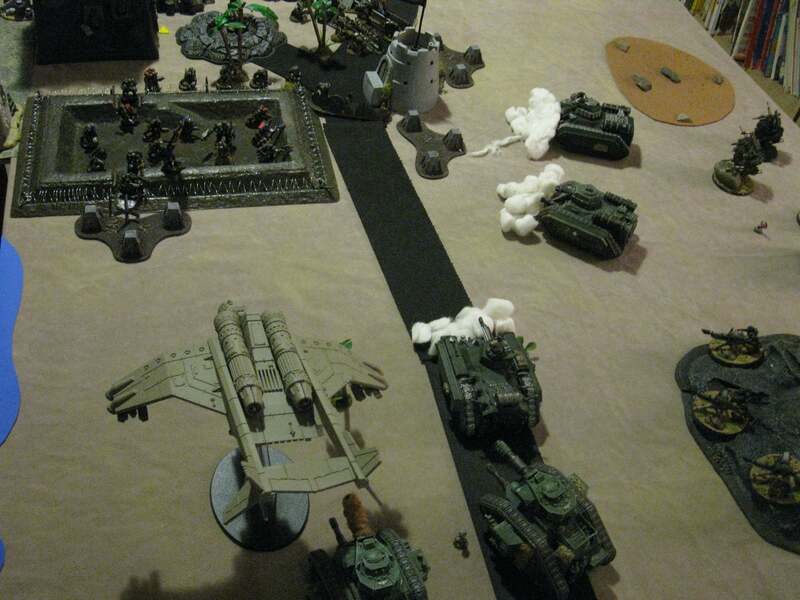 The Imperial Guard Chimera to the west of the defense lines charged forward, intending to breach the perimeter. It fell afoul of a ditch in front of the fortifications, however, and was immobilized. Nevertheless, fire from the Mortars on the Shoota Boyz was devastating, and their morale broke—sending them fleeing back towards the port in the hopes of finding a boat to safety. The turretless Chimera advanced slowly through the rubble of the destroyed bunker, firing upon the Choppa Boyz with both its hull-mounted flamer and the Ogyrn squad inside. Meanwhile, the nearby Veterans moved forward to claim the rubble, and their first objective. 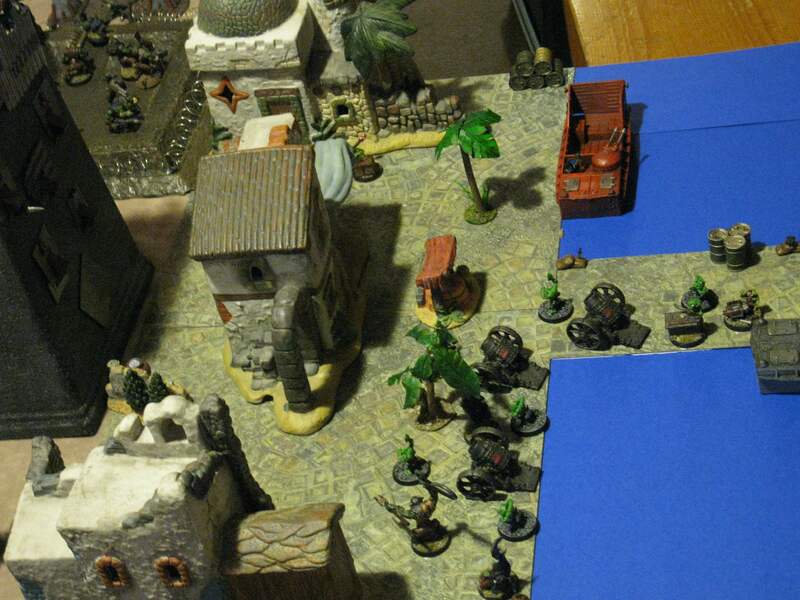 The Sentinels opened fire on the LRDM, destroying two of the Buggies. Imperial fire against the Bastion stunned the garrison, but failed to destroy it. Further Orkish reinforcements appeared on the scene. A boatload of Kommandos arrived at the dock and disembarked, running forward in the hope of plugging the widening hole in the Greenskin defences. 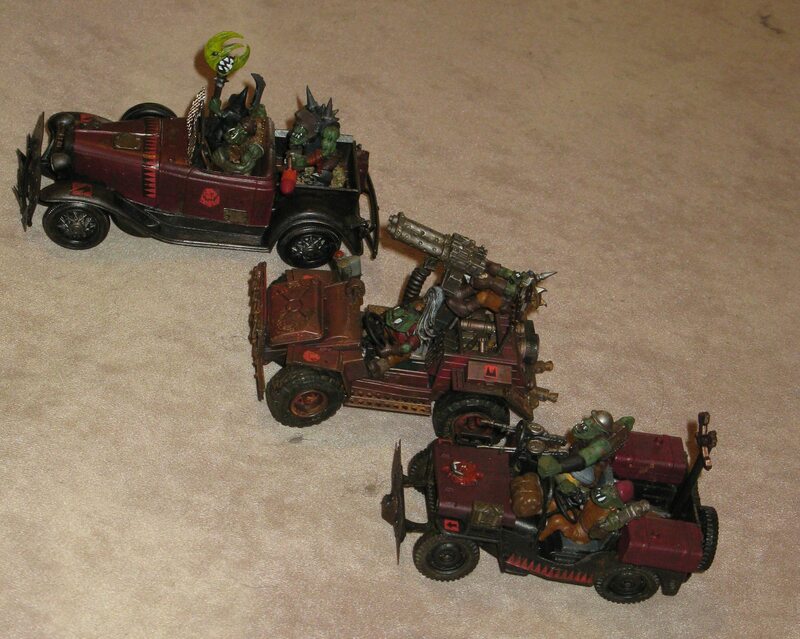 A Trukk Mob of Ard Boys appeared on road to the east, and sped forward. A Killa Kan appeared behind it, plodding more slowly. Finally, a second ROP Deffkopta arrived and jetted forward to assault the tank squadron with its Buzzsaw, stunning one. 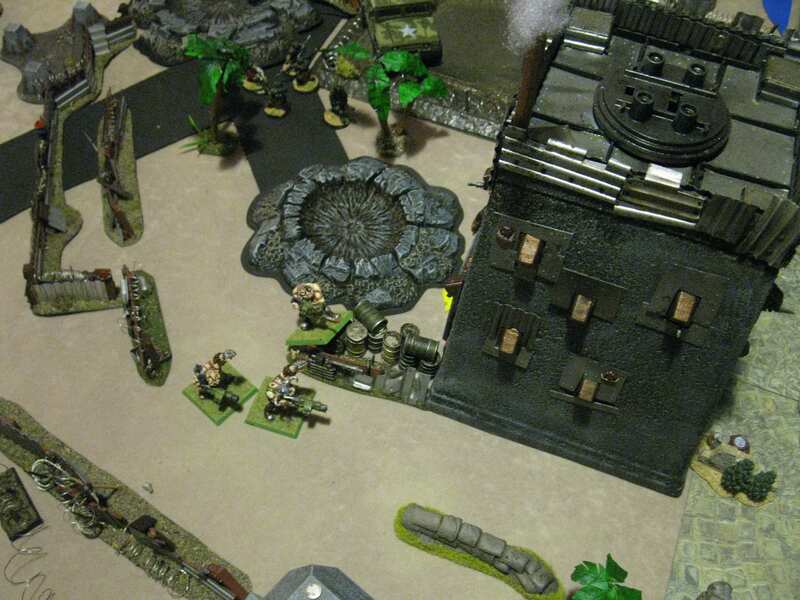 Inside Tobrork, the Lobbas opened fire one the Veterans, killing one or two, while a Rokkit from the Choppa Boys exploded the turretless flamer Chimera, forcing the Ogyrns inside to bail out. One took a wound from the Big Shoota of the remaining Ork Buggy. The Ogyrns roared with dismay at the shattered, smoking hulk of their Chimera, and charged the Choppa Boys to seek their revenge. One Ogyrn died in the fight, while the Orks held fast despite taking higher casualties. The two Sentinels to the south destroyed the remaining LRDM Buggy. Lascannons, Manticores, and tanks battered the Bastion, dinging the final Big Shoota. 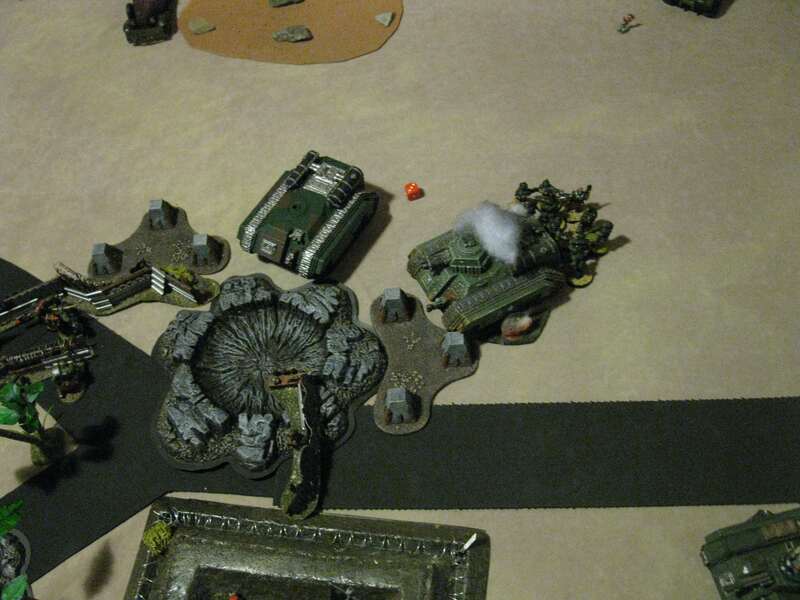 Fire from a Sentinel and nearby Guardsman took down the Buzzsaw-equipped Deffkopta. The Platoon Command Squad drove forward, reaching the edge of the now-abandoned Orkish defense lines. The last of the Orkish reinforcements–a Trukk Mob of MegaNobz—arrived. Like the Ard Boyz, they raced at top speed towards the city, passing first through the small village to the east. Orkish reinforcements continued to move forward. The Meganobz’ Trukk was immobilized by enemy fire, forcing the heavily-armoured Greenskins to advance more slowly on their heavily armoured feet. 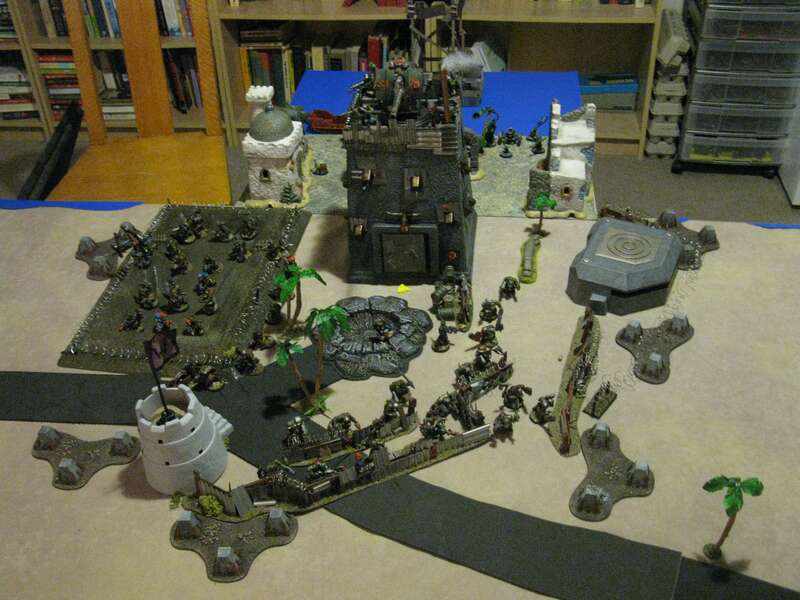 Declaring a Waaagh, the Kommandos run forward and assault both the Veterans and the Platoon Command Chimera. They kill a few of the former, while destroying the Multilaser turret on the latter. The Shokk Attack Gun continued to be largely ineffective, as did Imperial Tank and Lascannon fire against the bastion, although the Lootas inside were once again stunned. Just in time, however, the Ard Boyz arrived, despite having had the Big Shoota shot off their Trukk by a Sentinel. They dismounted, survived a misaimed shot from the Shokk Attack Gun, charge the remaining Ogyrn, and wiped them out in close combat. Encouraged by the arrival of reinforcements, the Lootas and Mek in the Bastion sallied forth and charged the advancing Veterans, destroying them too. They then consolidated forward, contesting control of the former southwest bunker. With this, night falls. On points, a bunker and the bastion are both contested, while the second bunker is under Ork control—a 1-0 victory on paper. However, it is clear that the beleaguered Ork forces will not long survive the withering fire of the three remaining Guard squads, two tanks, two heavy weapons squads, and the two unengaged Sentinels. The game is therefore called a draw. When we play complex scenarios of this sort, we usually post all the special rules well in advance so as to avoid confusion. In this case, however, we were discussing it all up until game time, which lead to some confusion when we played. It also led the me to forget that we had given the bunkers and bastion a defence stratagem each (power generators and ammunition store respectively). This made little difference to the game, however—perhaps the Valkyrie would have been destroyed rather than immobilized, but after that the Lootas in the citadel spent half the game stunned. We also encountered problems arising from the ambiguity of the KFF rules. Because we allowed it to affect buildings (on the grounds that they are treated as vehicles in the core rules), it was extremely effective at keeping the central bastion alive—which in turn drew considerable volumes of fire that could have wrecked havoc on my ground forces. The LRDM wasn’t terribly effective—I would have been better to have taken Boyz or another Deffkopta—but given the setting and how they are modelled they just fitted too well to pass up! The Shokk Attack Gun also did almost nothing, killing perhaps 2-3 Imperial Guards during the entire game. That, however, is an occupational hazard with a SAG—sometimes it does little, sometimes it blows up, and sometimes a single high-strength AP2 large blast will wipe out an entire enemy squad. Of the various special rules that we used, allowing a player to conceal the contents of buildings, bunkers and closed transports provides a much better feel to the game, so I’m inclined to use that again. I also liked allowing targets in buildings to be shot at, although perhaps a 2+ (rather than 3+) cover save would be more appropriate. As to house-rules etc. I think we just need to settle on them ahead of time, so we each know what we’re dealing with. I, too, liked the idea of not knowing what was in each building/vehicle until it fired. I wouldn’t suggest this for a pick-up game with a stranger, but as we know each other and trust each other, it makes for a more interesting story. As to the dreaded KFF, and its ability to span the globe with its cover…having it in the very large building (granting a large area from which to measure the 6″ to a unit), plus the spread out units it protected, effectively granted a 2’x2′ area cover saves. The KFF is just so ripe for abuse. One could effectively cover one’s entire mob with it by using the Mek as a hub, and deploying units in “spokes” radiating from that point…it’s just so very cheezy. If we were to do this again, I think it would be a good idea to reveal the use of such special equipment ahead of time, so we can figure out its effects. In the future, perhaps KFF can cover a building, but only that building. The structure prevents the force field from expanding? Or, it cannot cover a building, but otherwise operates normally. As to cover, normally a building should offer 4+ cover save. Only fortifications offer 3+, and 2+ is just unheard of (without stealth or some special ability). I like the idea of being able to target either the building (as a vehicle with AV) or the unit within. I’d go for a 4+ save with small arms. Ordnance, and blast weapons can only attack the building (with its AV), and possibly reduce the building to a ruin, while all weapons have this option instead of targeting occupants. Templates attack any building normally (d6 attacks + a hit on building). Lascannons, krak missiles etc can attack either the building, or the occupants (lucky shot through a window). In that case, perhaps leave the house cover save at 3+? It ought to be as effective as fortifications (in fact, a well-built house would be superior to a parapet since it provides overhead cover), and that also creates a natural step up from the cover of a 4+ ruin. If we’re to play Orkingrad, we’ll need so building assault rules. Perhaps all attackers who can move with 2″ of the door get to assault, as well as all of teh defenders (who count as in cover)? Obviously this would only apply to buildings, not bunkers. Should we also think of assigning very large buildings structure points? Or perhaps its easier to just treat them as a series of sub-buildings. a) treat buildings as “ruins” so we assault through walls/windows as normal. Occupiers are in cover. b) buildings are whole, so the building must be assaulted first, turning it into a “ruin”. Then an assault can take place (just as if a vehicle was “popped”). This provides an interesting “drama”, which may mirror the “reality” and danger of assaulting an enclosed building. Large buildings should be treated as a series of sub buildings. This is the 40k norm. A 3+ wouldn’t ever be the save for troops IN a bunker (who, rightly, are treated as invulnerable until the bunker pops, or hit with template weapons)–it is the save for troops in trenches (which seems about the same level of protection provided against small arms fire by a sturdy building). Hence why I called them “bunkers”. Only purpose built fortifications get a 3+. If one is treating a bunker not as a separate building, but a piece of cover, it would grant a 3+ cover save. Trenches are treated the same as buildings and walls…4+. Actually, I’m not sure why the core rules even list a “fortifications” saving throw if it doesn’t include trenches. Since a typical bunker completely obscures line of sight, if you’re behind it you’re not an eligible target. If you’re not behind it, you don’t get a cover save. If you’re in it or on the parapets, you can’t be targeted (under the core rules). On the other hand, it would be odd indeed if trenches–an excellent form of defensive cover–had the same save as a wall or a ruin. Fortifications get a 3+, I just used the word bunker, let’s not get hung up on that.. Purpose-built fortified walls, for example. Techmarines can also fortify ruins so they grant a 3+ cover save. There’s a wall (4+), then there’s a ferro-crete reinforced, ceramic, depleted goatronium permanent wall built for defense (3+). 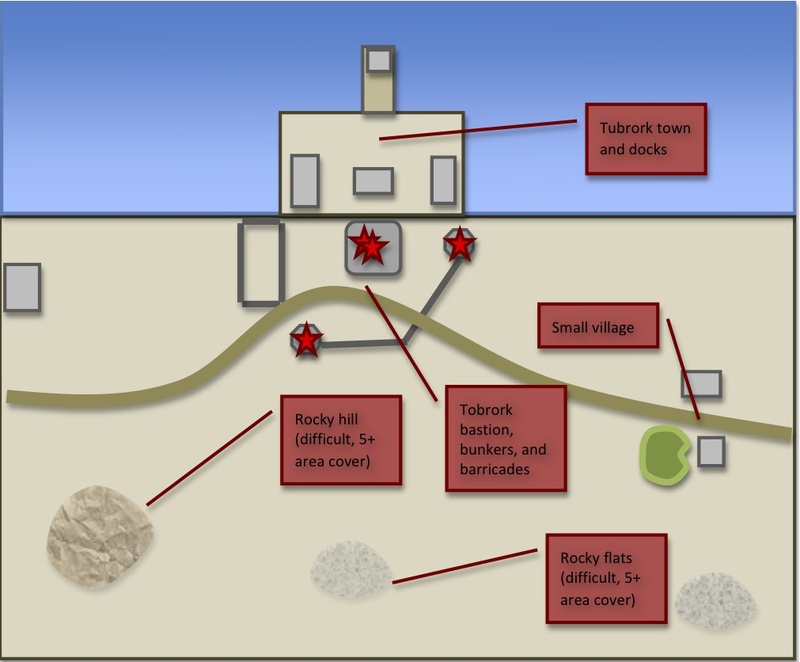 Where a “trench” might grant 4+ cover (since you have to poke your head out to shoot…), a fortified (covered, extra reinforcing etc.) trench could grant 3+ since you’re less visible, are protected from bursting shells and riccochets etc, for example. Further, not all players will play buildings as quasi-vehicles. Instead, they might use them simply to give cover. So a bunker might just be cover.